About a week ago we had a busy meeting day schedule at one of the schools, and some of my coworkers seemed pretty overwhelmed. The night before the meetings, I decided that I wanted to whip up something rich and chocolaty for my team. I decided upon these perfectly chewy cookies, which are fully loaded with chocolate and guaranteed to satisfy your chocolate cravings. Oh, and let me add that these cookies aren’t just for the ladies. Men will love them too! Ingredients Pricing – $$ (because of cost of baking chocolate, if you use Baker’s brand chocolate the cost would be significantly less). In a medium-sized mixing bowl, stir together the flour, cocoa powder, salt, and baking powder. Sift and then set aside. In a small bowl, mix together the eggs and vanilla with a fork. Add in the coffee powder. Stir, and let coffee powder dissolve in to the mixture. Put the butter in a large mixing bowl. Using an electric hand mixer, beat the butter until it is smooth and creamy. Add in the brown and white sugars, and beat until the sugars are well combined. Turn the mixer to low speed and gradually beat in the egg mixture until it is incorporated. Then add in the finely chopped bittersweet chocolate until it is combined in to the mixture. Turn the mixer to low speed, and add in the dry ingredients. Beat until just combined, and do not overbeat. Add the chocolate chips. Use a spoon or spatula to fold them in to the batter. Cover the bowl with a lid or plastic wrap and let it stand at room temperature for about 30 minutes. Preheat the oven to 350 degrees. Line a baking sheet with parchment paper. Using a 1 ¾ -inch cookie dough scoop, scoop the dough in to mounds and place on baking sheet. Make sure to space the dough about 1 ½ -inches apart. Bake the cookies for 10 minutes. Halfway between baking, rotate the pan 180 degrees in the oven. After cooking for 10 minutes, take cookies out of the oven and let cool for 10 more minutes. Then transfer them to a wire rack to cool completely. Makes about 20 cookies. Enjoy with 20 glasses of milk. 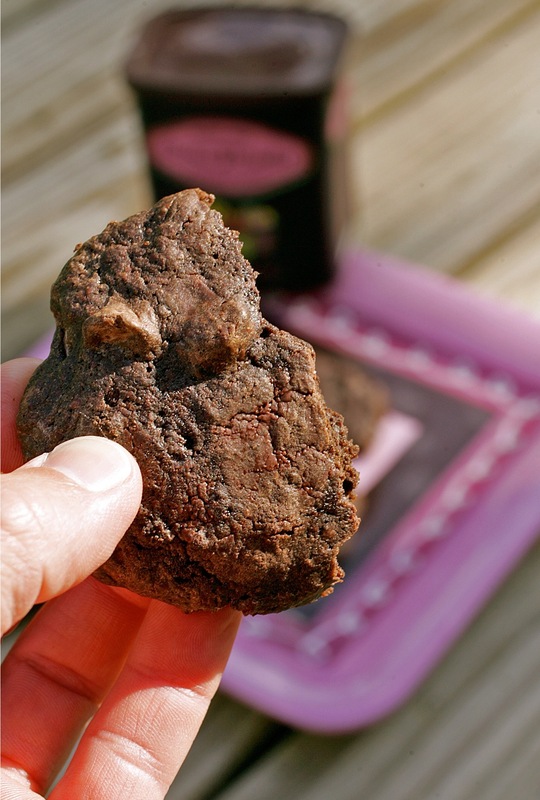 When I first started baking, I noticed that many recipes called for Dutch-processed cocoa powder. I did not know the difference between Dutch- processed cocoa and regular cocoa or why a recipe would call for Dutch-process over regular, and vice versa. David Lebovitz, who is an author and popular food blogger, shares a lot of great information about cocoa powder on his blog. Great stuff!